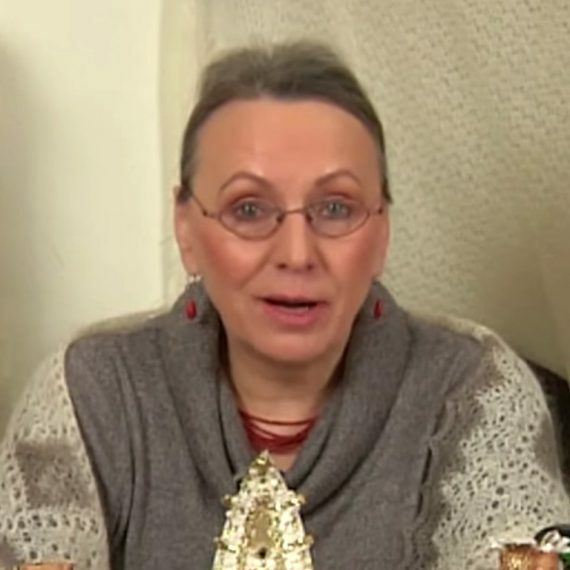 Galina A. Khmeleva, lace knitter/spinner extraordinaire, is the author of Gossamer Webs, The History and Techniques of Orenburg Lace Shawls and Gossamer Webs, The Design Collection. She has mentored classes all over the globe, including Great Britain, Italy, and Australia, and Craft Cruises’ Baltic Cruise. Galina’s work has appeared in numerous magazines including Piecework, Interweave Knits, Spin-Off, Knitting Traditions, Knitter’s Magazine, Cast on, Wild Fiber, and Verona (printed in Italian, Russian, German, Dutch, and English). Galina has most recently finished the following DVDs: Orenburg Knitting, Spinning Gossamer Threads, Knitting Old World Lace, and Knitting Lace in Intarsia.